Videogames are built on moments, whether those moments be built right into the fabric of the game or simply emerge from the experience of discovery and/or sharing gameplay with others. They are the difference between games you simply play and games you remember. 2014 was positively packed with instances that made gamers start conversations with “How good was it when…” These are the ten that stick out the most in my mind. MASSIVE SPOILERS FOLLOW for a number of story-focused games, so be warned. Throughout the majority of my time with Donkey Kong Country: Tropical Freeze, I wasn’t exactly paying attention to the story set-up that gave DK and his friends the motivation to traverse the game’s gorgeous and tough levels – I was simply enjoying the challenging gameplay flow, the sweet level design and the satisfying boss fights. That was until the final world, when I realised I had been island hopping rather than just exploring different parts of the same island like in the first DK Country Returns on Wii. I realised this because, after spending most of the game waiting for the “Freeze” part of Tropical Freeze to show up, it suddenly appeared in the form of the entire original DK Island. Each of the 8 worlds from the Wii game appears as a single level in this world, complete with returning music and signature design elements mixed with ice level tropes. A really *cool* touch from Retro Studios. Oh, man. 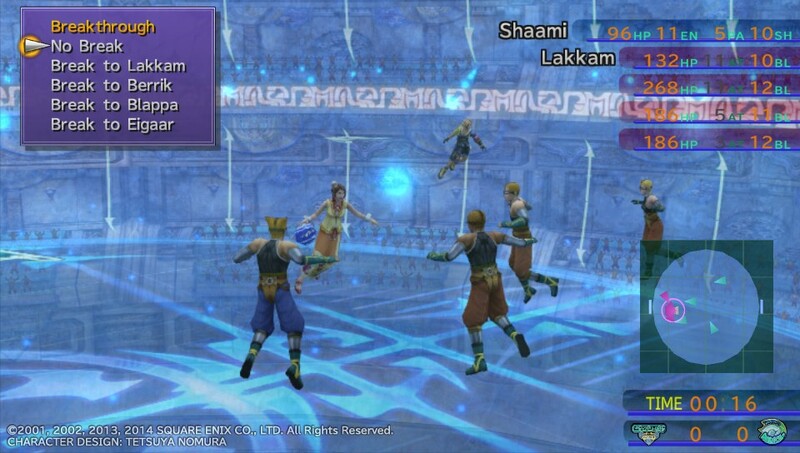 It didn’t take me very long to advance enough through my first-ever playthrough of Final Fantasy X (via this year’s HD Remaster) to reach the part where you can play Blitzball, also know as the Greatest RPG Minigame of All Time. But it did take me a long time to reach the point where I could stop playing it to move on with the story, and that was mostly due to one stupidly difficult game against the Al Bhed Psyches during one of my early tournament runs. Anyone who has played Blitzball before probably knows all about their utterly ludicrous roid-taking goalkeeper, who repeatedly denied my inexperienced attempts on goal for overtime period after overtime period after overtime period. Following every break my team members would level up, only to watch the opposing team do the same. I swear the match went on for hours, until I eventually realised I needed to starve the keeper and his teammates of EXP by batoning down the hatches and playing keep-away with my passing for several periods until I was high level enough to take one glorious winning shot. The feeling of relief was fantastic, and needless to say my matches were pretty easy for a while after that. 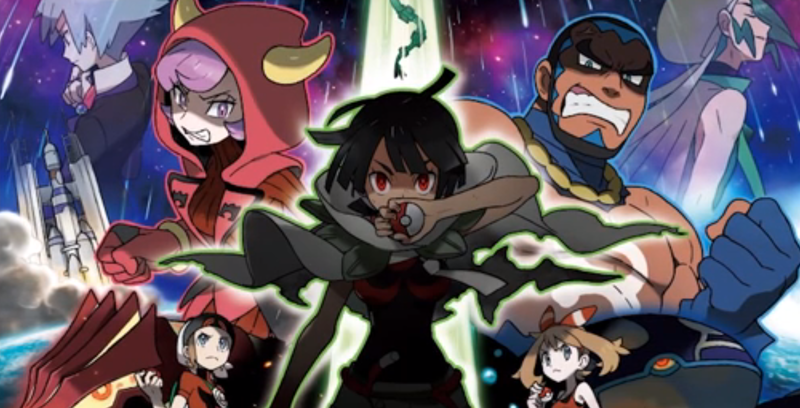 It has been a long, long time since I’ve really cared about the story in a main series Pokemon game, but Omega Ruby forced me to take notice, not only with its attentive care to recreating what was already a pretty decent main story with subtle additions here and there, but also with the ace up its proverbial sleeve: the Delta Episode. Taking place immediately after the main credits, this addendum modifies the original Rayquaza side quest from Pokemon Ruby and Sapphire and transforms it into what feels like an anime movie, complete with an insane new main character, some impressive visuals and music, a storyline that casts the entire rest of the franchise in an interesting new light and an upgrade for Rayquaza that literally turns it into the series’ single most powerful Pokemon. It was a pleasant surprise if ever there was one. Remember this piece of downloadable content for Bioshock Infinite, which came out in the first half of the year? No? Well go play it. Especially if you’ve played both the original Bioshock and Infinite, the two part Burial at Sea storyline is one hell of a ride packing very little filler content, unlike any of the main series games. And its ending well and truly lives up to the Bioshock series name, painting our heroine Elizabeth as a crucial piece in the puzzle that sets up the events of Frank Fontaine’s downfall in the first game. All head-screwy in the typical Ken Levine way and visceral the way first person narratives should be, it packs a real punch. Did Bioshock and Bioshock Infinite really need to be tied together at all? Probably not, but the tying is done so well in Burial at Sea that I’m glad they now are. The main narrative thrust of Telltale Games’ wonderful episodic series The Wolf Among Us comes from the power of the ex-villanous protagonist Bigby, whose struggles with his own nature and his influence on those around him make every decision weighty and meaningful. Yet he meets his match right around the midpoint of the game in the form of Bloody Mary, the legendary demon with the power to chase him down from just about any mirror in Fabletown. 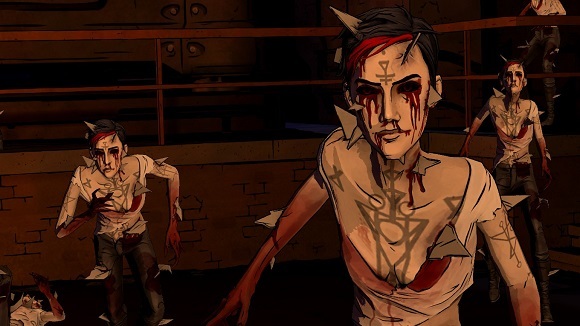 Tormented by the threat of her appearance throughout the remainder of the game, he finally faces her down in an abandoned warehouse during the meaty finale of the story. In an impeccably choreographed action sequence, Bigby’s full original form is revealed for the first time after he is overrun by Mary’s split-bodied assault. And you really do feel like the Big Bad Wolf when that happens. There are so many clever ways in which The Last of Us’ DLC story Left Behind takes the mechanics of the base game and repurposes them to tell a very different kind of story. Among inter-baddie brawls, photobooth shenanigans and imaginary quick time events, there is one moment that stands out to me where this repurposing nails the balance between tension, fun, functionality and emotional resonance. 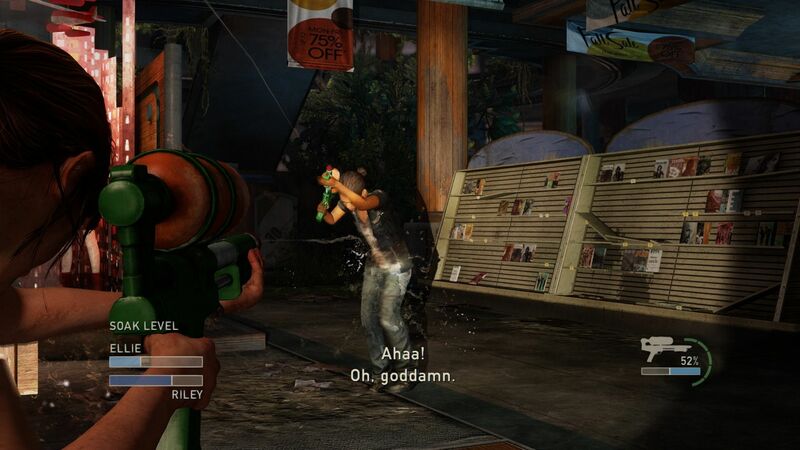 While exploring an abandoned mall, you and your best friend Riley find a pair of super soakers and set up a showdown with a tasty PSN Trophy attached. Using the very same stealth and shooting mechanics from the clicker-ridden main narrative, you must hit Riley more times than she hits you – and it’s more difficult than it sounds. The moment portrays the complex relationship between the two characters better than any cutscene could. It’s a great touch from developer Naughty Dog. For all the initial hate – not to mention current neglect – that has plagued the public sentiment on Watch_Dogs, the game has some really cool ideas. Chief among these, if you ask me, is the procedural hacking mechanic, which provided some genuine thrills during my relatively brief time with the game. In a brief glimpse of what this franchise is capable of with some more tuning, I found myself in a number of exciting situations while invading the games of random players online. Calmly driving like an NPC through a crazy traffic light shootout to deceive one of them was one such highlight, but my favourite social hacking moment had to be the one pictures above. The guy with the purple arrow above his head was frantically rushing to find me as I sat quietly in a beaten-up yellow sports car parked next to a dumpster. As his time limit ran closer and closer to my victory, he became more and more frantic, jumping on top of crates to try to scope me out and finally just shooting haphazard shots every which way until my gigantic EXP bonus was secure. Brilliant stuff. I could write an entirely separate Top 10 list just on shocking moments in the Danganronpa visual novel series (the entirety of which released in Australia within 2014), such is its contorted narrative brilliance and expertly deceptive pacing. Suffice to say picking just one to put on this list is more than a little difficult, so I’m just going to go with the first big one I encountered. I may not be a huge anime fan, but I thought I’d played enough Japanese games to pick up on foreshadowing story tropes before starting the series, so when the beginning of Trigger Happy Havoc looked to set up the character Sayaka Maizono as your typical female anime lead, complete with a shared backstory with the protagonist, an overly bubbly personality and a restrained visual design, I thought I knew she was safe. Then things got crazy, and before I knew it, that grisly shot filled my Vita screen, splattered in neon blood and accompanied by the signature blood curdling wail of the series. I was winded, and from then on it was clear as day that all bets were off – no character would be safe. And my oh my, was I right. South Park: The Stick of Truth is a game laced with all manner of jokes – loud ones, mild ones, envelope-pushing ones, chuckle-worthy ones, side splitting ones. line-crossing ones, blink-and-you’ll-miss-it ones… It’s like an entire season of the show in one fifteen hour experience. But they leave one of the absolute best jokes of the game until late. You see Canada on your South Park map every time you bring it up, but it’s nestled into the top corner like one of the game’s many throwaway references. Then you’re asked to go there, and after an amusing exchange with the border security officer, you step into the great white north to be greeted by the greatest gaming surprise of the year – at least in my opinion – an extended sequence of gameplay that replaces your normal viewpoint with an on-point reference to 8-bit JRPGs of old. There are towns, one-line NPCs, shops laid out in real 1980s style, some deliberately terrible animations (even by South Park standards) and a glorious chiptune version of the song “Blame Canada” from the South Park movie. Genius. I don’t have a lot of experience with MMOs – I tend to avoid them for the exact reasons that Destiny proved so comprehensively to me. In its first month, I was on Destiny as often as I could spare the time, moving through the missions and grinding for gear in the crucible alongside friends for hours upon hours in preparation for an attempt on the Vault of Glass, a team event with a fast-growing reputation for being incredibly difficult. By the time I had reached a suitable (well, arguably) level to get started, there still wasn’t a widely accepted strategy for beating any of its highly varied phases, so hours of frustration and arguments followed as we crawled our way through the trials and tribulations of the Vault. During our Raid my gaming time was rigidly set – if I dared to play something else after work, I would be letting five other people down. It was a new experience for me. Then, after three intense nights spanning the course of a week, encompassing double digit hours, hundreds of deaths and far too many team strategy adjustments to count, it finally happened. We executed a final boss run where every single team member nailed his role near-perfectly, and we erased the full health bar of our foe. At first we couldn’t believe it. Then it hit us. Two silver trophies popped, and the relief of all that pent-up tension dissipating washed over me like a powerful wave. A bunch of us whooped like Americans in a Hollywood sports movie. I’m pretty sure I may have teared up a little. 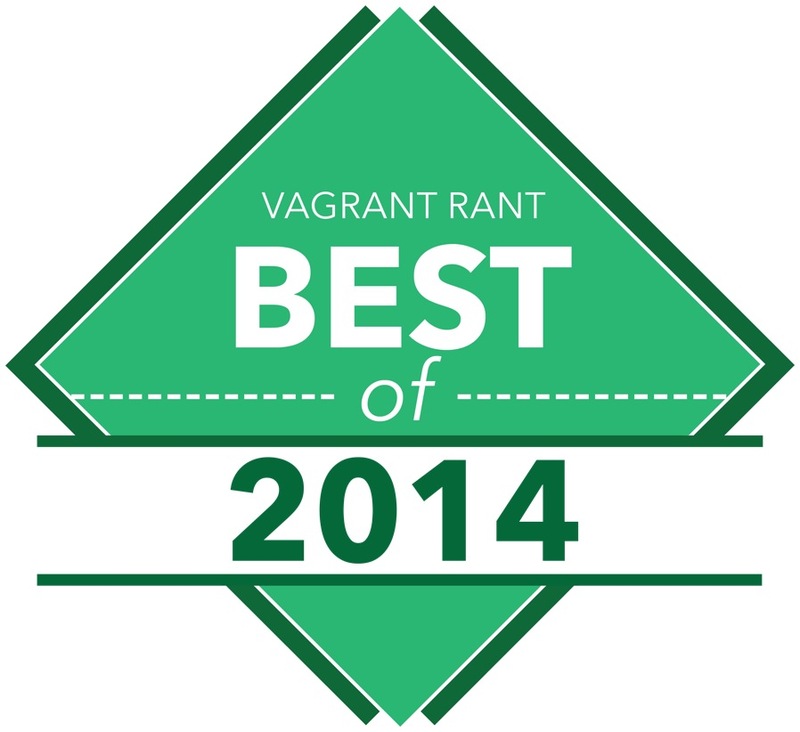 No gaming moment in 2014 felt that good. And I haven’t played Destiny since. The first time you find the back of the net in a new FIFA game is always special, but after conceding a sloppy goal in my very first Everton game of FIFA 15 I hit back by chipping the last defender in my opponent’s line and hitting a sweet first-time volley with Romelu Lukaku, right into the top corner of the net. I could never have scored a goal like that in FIFA 14. I instantly knew I would like this new instalment of the mega-selling franchise. Yes, another Watch_Dogs one – believe it. I’m not exaggerating when I say I spent more time playing and replaying the amazing power trip minigame “Spider Tank” than I did in the main story missions of the game. I mean, you control a freaking spider tank. A spider. Tank. And it can crawl up walls and crush cars and wreck things with various weapon types. So good. Though Infamous: First Light is a shorter and less varied experience than its immediate predecessor Second Son, its story is also more focused. This comes to a head near the end of the game when you get to experience the emotion-loaded drug haze that leads to protagonist Fetch’s accidental killing of her brother. And it is INTENSE. Legitimately the toughest of the many tough decisions I had to make in Season 2 of Telltale’s The Walking Dead came when I had to choose whether to sit at the table of an old troubled friend, or a newfound confidante. I agonised about the choice for what seemed like hours, and such is the beauty of Telltale’s recent videogame work.